This was published at Ceasefire Magazine. The anti-imperialist left, in the West at least, is painfully divided over the NATO-led intervention in Libya. On the one hand, such commentators as Paul Woodward, Gilbert Achcar, Phil Weiss, and me, believe the intervention is the least worst option, that there was no better alternative. On the other hand, John Pilger, Mahmoud Mamdani and many others, are wary of a new Iraq and oppose Western intervention on blanket principle. Both positions are legitimate. Although I disagree in this case, I’m very pleased that the general gut response – if we must work by gut responses – is against intervention. But unfortunately a number of lesser figures, emotional oppositionists of the sort who qualmlessly rearrange reality to fit their personal agendas, have wilfully ignored facts on the Libyan ground, and even stooped so low as to slander the revolutionary Libyan people. Some say NATO is interfering in a civil war, that Libya is split between east and west, that Tripoli stands firm with Qaddafi. These people fail to understand the overwhelming unpopularity of Qaddafi’s capricious regime. In the first days of the revolution, the regime lost control of most areas in the west as well as the east, including suburbs of Tripoli. Protestors marching on Green Square (or Martyrs Square) were driven back by machine gun and artillery fire. Qaddafi is currently keeping the capital quiet by mass arrests, rooftop snipers, and roving jeeps of weapon-wielding thugs. Some people describe the free Libyans are mere ‘so-called’ rebels. If they were real freedom-fighters, these people argue, they’d be able to take over the country without foreign help. Their acceptance of intervention proves them to be CIA stooges, agents of imperialism, traitors. And so they repeat regime propaganda. They didn’t repeat Tunisian or Egyptian state propaganda during the revolutions in those countries, so why is Libya different? One reason is the inexplicable belief among some that ‘Brother Leader’ Qaddafi is a socialist, anti-imperialist hero – against all the evidence, simply because ‘the empire’ is acting against him now. At a crucial stage in their revolutions, the Tunisian and Egyptian armies stood with the people. Much of Libya’s army did so too, but Qaddafi had taken care not to build a serious army, which left the people largely unprotected from attack. When they called for help – from the Arabs, Europe, anyone – Western ‘dissenters’ held their noses. The lesson for Arab revolutionaries seems to be, Don’t Lose. If you lose, Western leftists will stop regarding you as exotically glorious, and turn on you in their disappointment. A lot of these people suffer from exaggeratedly romantic notions of people power. The only person I met in Cairo who unabashedly opposed the intervention was an American leftist, who told me she had “absolute faith in the ability of the Libyan people to defeat Qaddafi’s forces.” I’m glad she was honest enough to use the word ‘faith’. In the secular world, might usually does conquer right; majorities are very often subjugated by tooled-up minorities. Zionist Jews are a tiny minority in the Middle East, yet they dominate by force. In Libya, enthusiastic but untrained civilians, even with the aid of defected military units, are no match for Qaddafi’s well-armed, well-trained special forces. Another frequently-heard line is that there were options other than foreign intervention. The rebels should have negotiated with Qaddafi. I would suggest that the propagators of this fantasy don’t know much about police states, and haven’t been following news from Libya. Qaddafi murdered thousands before the intervention. Over 90 were killed in a barrage on Benghazi in the hours before the air strikes began. Qaddafi has a history of large-scale slaughter – 1200 unarmed prisoners were massacred at Abu Slim in 1996 – and this time he’d explicitly promised to kill as many protesting Libyans as he could, “to the last man, the last woman, the last child.” He called the protestors cockroaches, rats, cats and mice, children drugged on alcohol and hallucinogens, servants of Italy, Britain, America and Israel, Islamists and separatists. He promised to burn ‘the green and the dry’ (an Arabic expression which means to destroy absolutely everything), and to “cleanse Libya house by house.” This is what he is doing in the cities under his control right now. He turned first Zawiya and now Misrata into south Lebanon or Gaza, besieging the inhabitants, slaughtering them with cluster bombs and missiles. Yet some outsiders laugh off Qaddafi’s threats as rhetoric, or pretend they didn’t hear. There was no other option for the Libyans than to accept the intervention. They can’t be blamed for planning poorly – they had no opportunity to plan because they lived under a dictatorship crueller and far more total than Mubarak’s in Egypt. And they didn’t expect the revolution. Inspired by the rebellious neighbours, a few protested the arrest of a lawyer. 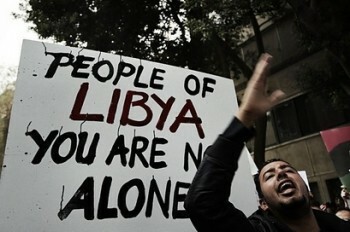 The protests spread so rapidly because of Qaddafi’s ultra-violent response. The people revolted en masse because they were being attacked. The revolution was popular and spontaneous. It was not, as Qaddafi-supporters assert, an armed insurrection. In Benghazi and elsewhere civilians swarmed military bases, took on snipers with their bare chests, overcame bullets by absorbing them. One man filled his car with petrol and drove into a gun emplacement. The next morning they found themselves, unexpectedly, free. Until Qaddafi’s forces recovered. Too many outsiders speak from a position of zero responsibility. They won’t be pinned down to answer the obvious question: what should have been done? If Qaddafi had got into Benghazi and done what the Syrian regime did in Hama in 1982, or what the Iraqi regime did to the Iraqi south in 1991, wouldn’t we now be condemning Western inaction? Even if it’s the least worst option, foreign intervention remains problematic. As military stalemate sets in the danger of mission creep escalates, even to troops on the ground (which I would oppose). But Libya is not Iraq. The left fears it might be because the left has an oil obsession – but the 2003 Iraq invasion was more about the Israel lobby than Big Oil. Post-war, countries which didn’t take part in the invasion are winning more contracts than countries that did. In any case, Qaddafi did great business with the West, doing oil deals, buying weapons, as well as torturing rendered suspects on America’s behalf. I would expect any future Libyan government to also do business, and with the Arabs, China and India too, I hope in a much more accountable manner. Libya isn’t Afghanistan either. Politically and financially, America has just lost two wars, and knows it. America would lose in Libya too if it tried to occupy the country or intervene directly in post-Qaddafi politics. So am I saying the West is involved for purely altruistic reasons? Of course not. All powers act according to their perceived interests. Britain, France, Qatar and the others are not exceptions to the rule. Migration bothers Fortress Europe, the prospect of a million refugees from Qaddafi’s repression. And the spectre of a long-term collapsed state across the Mediterranean, a country Qaddafi would never again be able to control absolutely. Plus fear of the diversions the unhinged, half-finished dictator might plot were he given the time. And the desire for it to seem, at home and in the Arab world, as if Britain and France are on the side of freedom (a doomed desire). Finally, the intervention is an early attempt to make friends and influence people. I hope the revolution continues and develops and deepens after Qaddafi. I hope that once Libya gets on its feet it will act with independence. There are already signs that the people are tiring of their current representatives in the Transitional Council, who have been slow to organise, many of whom are tainted by cooperation with Qaddafi’s regime. The extent to which Libyans live up to the coming historical challenge will be the Libyans’ business. At least if they are alive they’ll be able to try. Alongside Britain and France, Lebanon –with Hizbullah in government – co-sponsored UN Resolution 1973. Hassan Nasrallah’s later speech on the issue contained warnings concerning Western intentions and reminders that the West cares nothing for the suffering of Arabs in Palestine. But Nasrallah did not condemn the intervention. This is because he’s a realist as well as an idealist. He knows a revolution has no chance when all the revolutionaries are dead. Of course, it would have been best if the Egyptian army had intervened, or perhaps a coalition of free Arabs from Tunisia and Egypt. But the Egyptian army is needed at home, and may be in a precarious state internally. The police are still sulking, so the army are on the streets. Plus there are several hundred thousand Egyptian workers still in Libya, who Egyptians fear would be potential hostages. So those who look forward to a regional security policy which will keep the West out have to be realistic and patient for the time being. The revolutions are ongoing, and in most places have not yet reached the first stage of success. I’ve recently returned from Egypt, where people are living the revolution rather than talking the talk. I met many who wished that Egypt had gone in to Libya (Egypt probably is arming and training the revolutionaries now). I didn’t meet anybody who was clearly against the intervention, except the American lady I mentioned earlier. Meanwhile, some Western commentators are so dazzled by the imperial bogeyman in Libya that they fail to notice Bahrain, where Israel, Wahhabi sectarianism, corrupt Arab princes and US military strategists are once again agreed on the need to crush a people. A country in which the West’s fingers, most obviously in the form of the US Fifth Fleet, are far more deeply dug. Read about Alan Kuperman’s lies here. Kuperman is a bomb-Iran Zionist, but his propaganda is being used by some leftists. An excellent piece by Paul Woodward here. Robin, just wanted to say a quick thank you. You are putting into words the nuanced but crucial view that I mostly hold. Knee-jerk leftists, rightists or any -ists fail to see that when multiple streams of history, politics, revolution, and economics collide, the answers rarely fit into one -ism. One can be in favor of this intervention as a least bad solution even as one recognizes the ulterior motives of those intervening. Power relationships I think are one of the key principles to watch. Comfort the afflicted and afflict the comfortable as the old journalists’ saying goes. But recognize that who the afflicted and comfortable are, are constantly changing, and often the same party can be both the good guy and the bad guy depending on which angle one views them from. That makes the situation messier, but no less deserving of a thought-out moral judgement. Keep up the good work. I would just like to say that I really enjoy your writing. Its refreshing to read a piece that understands the nuance and takes on responsibility. Do you think certain Syrian opposition members are right to seek support in the West in their fight against the Baath regime? Thanks, Christian. I think it’s right for Syrians to ask for Western support in terms of targetted sanctions on regime figures and crimes against humanity charges against these people. If any Syrians are asking for Western military intervention – are there? – I think they are wrong. Syria is not Libya. The regime in Syria, unfortunately, has more support than Qaddafi. Certain minorities are afraid of change. Foreign intervention could cause a sectarian war, as it did in Iraq. Alos, Syria is next to occupied Palestine, which complicates things.